This mom is taking Facebook and the internet by storm. It’s not because she made a major booboo or because of some extra ordinary talent that she has … it’s because she reminds us that sometimes it’s just the simplest, mundane things that can really make us very happy. … at the end of the day, this is mine that I bought and I’m gonna keep it for my own. From that point on in the video, she just could not contain her excitement and giddiness. As she does a demo of the Star Wars Chewbacca mask, her giddiness turns into an infectious laughing fit. You just have to really see it yourself. GREATNESS!!!!! We are laughing! So fun! OMG that is freakin awesome!! I don’t know what’s more awesome though… The mask or it trying to keep up with your laughter! You won the internet today! Best thing ever!! I still laugh just thinking about it! This is the best video of the year….period! You are so funny and I’m buying that mask asap! 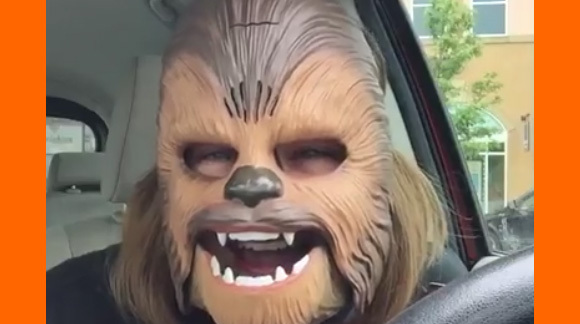 Chewbacca Mom’s video has, as of this writing, garnered more than 111.0 million views (and still counting). To watch this must-see the video, go to the next page.